The level of form, function, and value this Vitabri V3 10 x 15 Aluminum Pop Up Canopy with Waterproof Top is what absolutely separates it from other shelters on the market. This isn't a radical new invention made with science-fiction components, it's simply a tent made from the best materials available with the most intelligently-though-out design you'll find anywhere. Get some specifics below about why this shelter is so different. When it comes to outdoor shelters, everything starts with the frame. This tent has that section covered in spades. The pop up design of this canopy takes seconds to set up and take down, plus you never have to remove the top. Once in place, you can take advantage of the telescoping aluminum legs with three available height settings, the reinforced cross-bar roof system that offers all kinds of stability, or the incredibly light, incredibly strong polypropylene junctions strengthened with fiberglass. Or you could check out the stainless steel fasteners, or the cast aluminum feet. Whatever you prefer. This shelter's top, though, is every bit as impressive as the frame. The roof is made of heavy-duty 1000 Denier vinyl that is as strong and durable as you'll find in any shelter. It is waterproof, mind you, not water-resistant like many competitors, so you, your guests, and your stuff will be safe and protected. The top features self-locking straps that keep roof tension perfect at all times, the corners are reinforced to prevent damage from friction, and there's even a Velcro strip to make sidewall addition (sidewalls must be purchased separately) simple if you choose to add them at any time. Every aspect of this shelter is designed to be user-friendly, incredibly strong, incredibly stable, and great to look at. All of that, plus you'll end up spending about the same as you would on some run-of-the-mill unit with half the functionality and half the life span of this one. That combination of factors is the driving force behind the meteoric rise of the Vitabri V3 10 x 15 Aluminum Pop Up Canopy with Waterproof Top to the top of the outdoor shelter industry. Vitabri V3 Premium Pop Up Canopy Demonstration from eCanopy.com Setup of a Vitabri V3 Premium Pop Up Canopy. Available from eCanopy.com. * Flame Certification: This item is CPAI-84�Flame Certified. Is there a way to fasten this canopy to a wooden deck, so that it doesn't move during a mild storm? What would you recommend to put up on a deck that we could keep the spring-fall season (and take down in winter time)? I would recommend heavy weights. However please note that, while this is an incredibly durable pop-up canopy, it is still a temporary shelter made of moving parts and is not warrantied against weather and may not survive multiple seasons of being left up. This canopy has 100 percent waterproof vinyl top with a sturdy 2 inch thick aluminum frame. 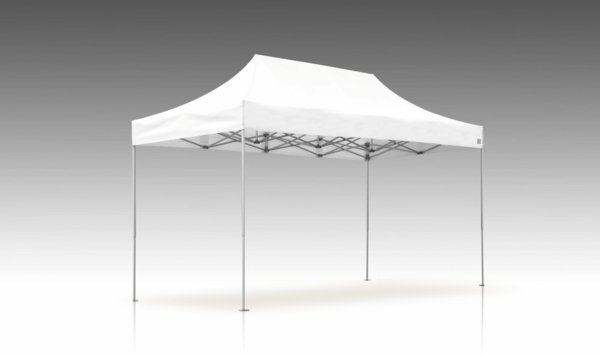 It is by far the most durable pop-up canopy we sell. However please note that all pop-up canopies are temporary shelters composed of moving parts and, no matter how well made, may not stand up to a strong storm. Be sure to always keep your canopy supervised if you expect inclement weather. We were in need of a waterproof canopy to use at the entrance of a drop of / pick up area at a senior day care facility for inclement weather. This large waterproof canopy is working out great for us. It is large but easy to set up and take down depending on the weather.